BAM Tracker Officially Launched Today! It has taken a long time to get here but the time has come and BAM Tracker has been officially released. 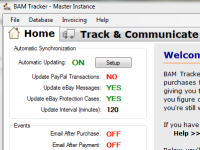 BAM Tracker is another software by Buyer Auction Manager for bulk eBay buyers. Unlike BAM Seeker that helps you purchase items on eBay, BAM Tracker helps you manage eBay purchases. It takes over once you win given auction and helps you all the way until you receive your item and are satisfied with it, cancel it or return it. 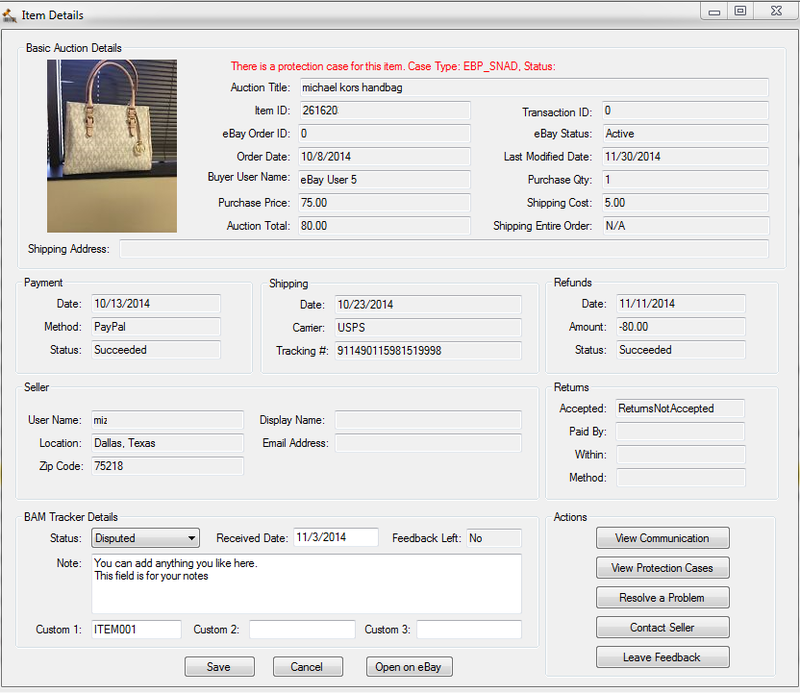 BAM Tracker is your bulk purchase managing software that synchronizes your transactions with eBay and PayPal so all the information that’s available for given auction is at your fingertips. It updates changes automatically so when seller makes changes on eBay such as adding tracking numbers, those changes show up in the software within minutes. It can send messages to eBay sellers automatically, help you communicate with sellers more efficiently and help you find who given item came from. If you purchase in bulk on eBay, BAM Tracker is for you! Click here to see BAM Tracker press release. Click here for more details about BAM Tracker and download link. If you purchase large volume of items on eBay each month, you know the pain of managing those purchases. It’s very difficult to keep track of what you already received, what needs to be returned to the seller and what needs to be cancelled. It's hard to know which items you need to follow up on because you haven't received them in a reasonable amount of time. Then you also need to spend the time and effort managing protection cases. BAM Tracker can be set up to update your orders from eBay every few minutes. When you purchase an item, it shows up in the software automatically. It pulls most information available on eBay for given item which includes standard auction details such as item number, title, seller user name, prices, payments and refunds. 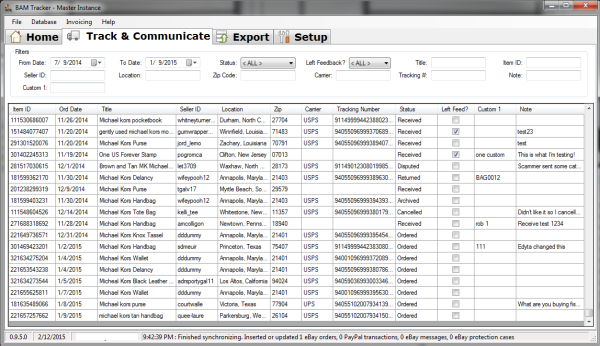 It also gets information such as tracking numbers, carrier shipped, item location, item zip code and shipping address. Those can greatly help you identify who given item came from. When there are changes on eBay, such as seller marking item as shipped or adding tracking number, those changes are synchronized as well so you always have the latest information. Once eBay transactions are retrieved, BAM Tracker can also synchronize with PayPal, pulling payment information for your orders. It gets seller email address as well as their name so if you can’t figure out who given item came from using information from eBay, you might be able to find it using information from PayPal. For example, you can enable Email After Payment event where you create a message asking seller to include their user name and auction number with the item. This way, when you receive given item, you’ll be able to easily identify who it came from. As stated above, BAM Tracker allows you to save custom email templates. Once you create a few for your specific situation, you can just select one or multiple auctions and choose Email Seller. This brings up Send eBay Message screen, where you can select what email template you want to use, make any changes for this specific message and send it to one or many sellers at the same time. BAM Tracker also allows you to download messages from eBay so you can easily view all the messages that relate to specific auction. Once you receive given item, BAM Tracker helps you figure out who it came from. It has very powerful searching capabilities that allows you to find items using standard eBay fields, such as item number, seller user name and tracking number and also more advanced fields such as item location, origin zip code and even seller name. You can type (or scan) tracking number, auction number, city that given item came from or even seller name into filters and the software will instantly find all auctions that are matching. You can also type only part of the information such as the last 5 digits of the tracking number and BAM Tracker will give you all auctions that match your search. If given auction was cancelled, you can just change the status to Cancelled and put your own note so later on you know what happened. Same with returns. You can keep track of when you shipped it back, tracking number in the notes section or using one of 3 custom fields that are there for your use. Once you're done with given item, the software can also leave feedback for you and if you choose to set it up, automatically send follow up message to the seller. BAM Tracker was created specifically for eBay buyers who purchase large volume of auctions each month. If that’s you, you know how difficult it is to keep track of your purchases and I’m sure you’ll find BAM Tracker to be of great benefit to you. Go to BAM Tracker page and try it for yourself! There are a lot of tools for eBay sellers out there but not so much for eBay buyers. If you purchase a lot of auctions on eBay, one of the most difficult tasks you have is probably keeping track of those items and communicating with sellers. It’s pretty easy if you only purchase couple of items a month. You can just leave feedback when you receive given item and this way you know what you already received. Once you start purchasing 100+ items each month, the task of keeping track of what you already received, what you’re still waiting for, protection cases, what was cancelled and refunded becomes more and more difficult. A while back, I used to purchase around 500 small items on eBay per month so I know the pain. I used to copy new items from my eBay buyer history page each day (that page is no longer available) and paste them into Excel spreadsheet because it gave me the information that I wanted. From there, I would add my own custom fields to the spreadsheet and once items started coming in, I would put the date I received them and notes such as when protection cases were opened so later on I could follow up with the seller. This was a lot of time consuming work. Most of the items that I purchased did not get shipped with tracking so I couldn’t find them by tracking numbers. They were also very similar so looking at pictures didn’t guarantee that I’ll be able to match the item to the auction. Some sellers were good and included packaging slips from eBay or PayPal so I could easily figure out who given item came from by item number or their eBay user name. Not everybody did that though so I would spend hours going through eBay listings, updating Item locations and if that didn’t work I would go through the export of PayPal transactions looking at the names trying to match who it came from. At that time, I would have loved to have a software that would make tracking my purchases a lot easier but there was nothing out there. Towards the end of 2013 and in at the beginning of 2014, I talked to some people who purchase large volume of items on eBay and most of them (the ones who did not have their own custom solution that they developed over the years) felt the same pain. I pitched the idea of a software that would help them receive their eBay purchases and they loved it. It took a long time to become reality because it wasn’t the highest priority project on my list but the software is finally here. 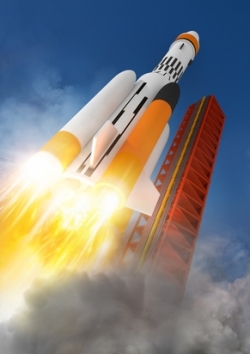 It’s called BAM Tracker and it’s officially launching later this month. If you purchase 100+ auction on eBay per month, the software should be of great benefit to you. If you purchase over 1000 auctions a month, you either have your own custom solution that you probably paid thousands of dollars to develop or you need BAM Tracker to stay in business. How do you currently keep track of your eBay purchases? Let me know in the comments section. 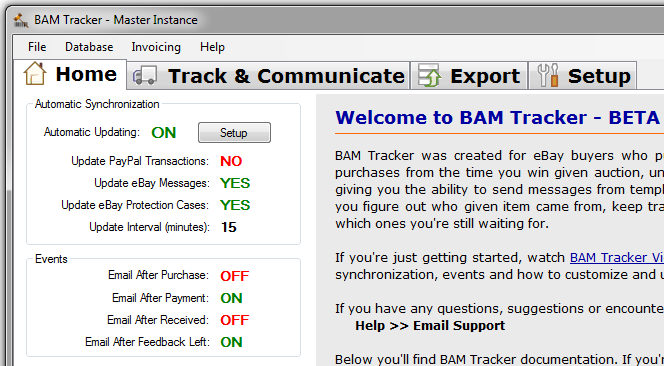 BAM Tracker is another software for eBay buyers from Buyer Auction Manager. This one is geared towards buyers who purchase a lot of auctions each month. If you purchase several hundred or more items a month, you know how difficult it is to keep track of your purchases. Some sellers do not ship with tracking or do not add tracking numbers to eBay. Others will send you just the box without auction details or any other information you can use to identify who given item came from. You keep getting frustrated trying to figure out who sent you your items and which ones you're still waiting on. If that’s you, BAM Tracker will make your life a lot easier. The software can automatically synchronize with eBay and PayPal, getting new items within minutes after you purchase them and updating existing items with information such as tracking numbers and item location. It has the ability to send automated messages to sellers right after you purchase win auctions, after you submit payment, after you receive item or after you leave feedback. You can use that to set up automatic notifications to go out, right after you pay for an item and ask seller to include item number with the package. This can significantly reduce your stress because now it’s easier for you to figure out who given item came from. Once you get a package, BAM Tracker allows you to search by things such as tracking number, seller location, zip code, auction title or even by seller name. Once you find the item in the software, you can mark it received and leave feedback right away, contact seller or open eBay case. You can add your own notes that you can later use to search for items and you even have custom fields that you can use to somehow identify your items. BAM Tracker has been in Beta for about a month now and a lot of changes have been made. New functionality has been added and the software is almost ready for officially release. If you haven’t tried it yet, go to BAM Tracker details page and try it for yourself.